Peaceful Reader: I did something revolutionary this week! Don't you get tired of buying cans, boxes, jars or cubes of veggie, beef or chicken stock? On my ongoing quest to bring less "stuff" into my house, especially the kitchen, I started to re-evaluate my constant need for stock. While searching through my favorite crock pot book, Fresh from the Vegetarian Slow Cooker by Robin Robertson I ran across an easy recipe for stock and thought I should give it a try. Maybe some people do this all the time but it was a revelation for me-how ding dang easy it was to make and how great it made my house smell. It made enough for me to use for the next two weeks with some to freeze. Give it a try-here's the recipe. I no longer have to worry about purchasing too salty or expensive boxes of organic stock. Thank heavens. I also set up my mise en place for this recipe which made me feel extremely cooking cool. A 5 1/2-to 6-quart cooker is best. 1. Drizzle the oil in the bottom of a the slow cooker. Add the onions, carrots, celery, garlic, potato, parsley, bay leaf, and peppercorns, pour in the water, and add the tamari. Cover and cook on Low for 8 to 10 hours. 2. Allow the stock to cool slightly, then strain it through a fine mesh sieve into a pot or bowl, pressing the vegetables against the sieve to release all the juices. Store the cooled stock in tightly sealed containers where it will keep for 3 to 5 days in the refrigerator or in the freezer for up to 3 months. As I came down the stairs that morning there was a delicious smell filling the house. Now I'm ready to make the several soup recipes from Moosewood that I was interested in as well as the No Hurry Vegetable Curry on my menu for this week. How 'bout you? Do you make your own or buy the box, cube, jar or can of stock? 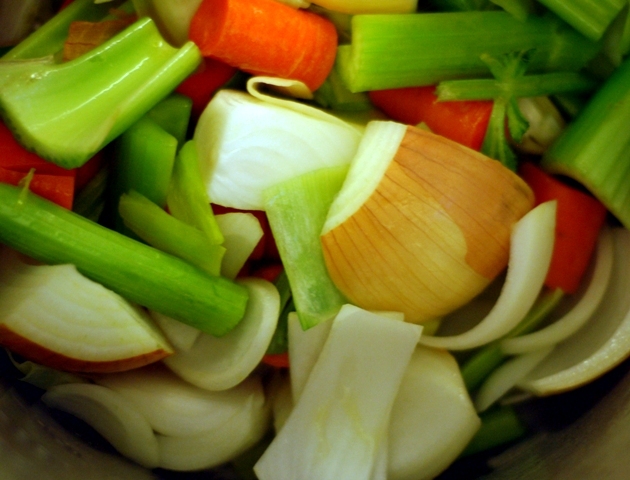 Do you have a favorite stock recipe?